The Chicagoland area will get treated to plenty of MMA this week. Here’s a rundown of the events. Bellator returns to Chicago for Bellator 25. The exciting Zoila Frausto (7-1) will battle the undefeated, #6-ranked flyweight Jessica Pene (7-0). Damian “The Polish Pitbull” Grabowski (12-0) will take on Scott Barrett in a battle of heavyweights. Bellator Season 2 Welterweight Tournament runner-up and local favorite Dan Hornbuckle will face off against UFC veteran “Bad” Brad Blackburn. Undefeated Division I NCAA Wrestling Champion Cole Konrad takes on submission specialist Rogent Lloret in another heavyweight tourney showdown. “Mr. International” Shonie Carter will take on Torrance Taylor, a one time Strikeforce fighter. Brian Gassaway will battle Kevin Knabjian in a match of two local fighters. Mark Miller was supposed to fight on the card, but he has been forced to withdraw due to injury. Keoki Cypriano will face Eric Kriegermeier in the promotion’s third show in the Windy City. Visit Bellator.com for ticket info. The Gilbert Grappling produced event is back with another card full of promising amateur fights. Here’s a great fight video from the last G2 featuring Jon Reed vs. Kenny Jordan. 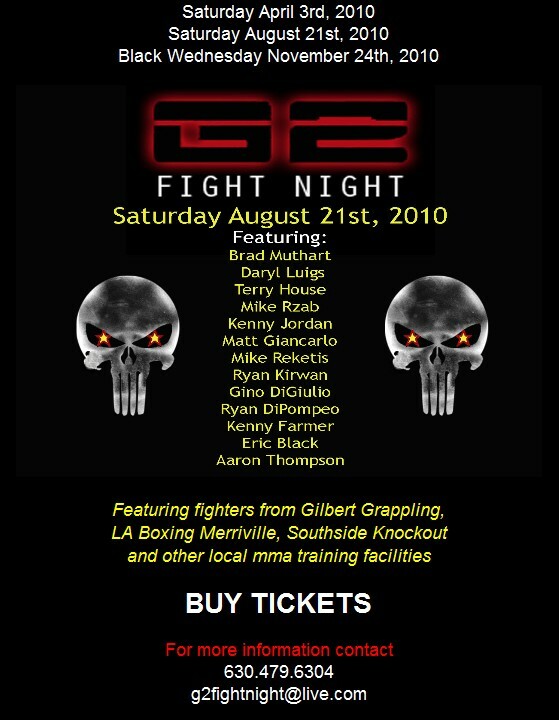 For more information contact 630.479.6304 or send an e-mail to g2fightnight@live.com. The second event produced by APFC will once again be held in Lemont. You can buy tickets and check out the full fight card at the American Predator FC website.